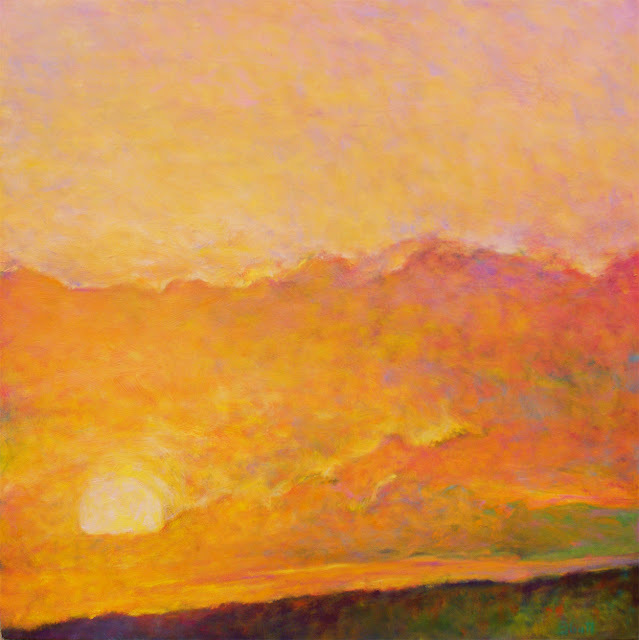 This is a cropped version of a 5 foot sunset painting from months back. I was intrigued by the idea of doing that bright ball in a painterly rather than decorative or illustrative way. It's so easy to do something ordinary out of a sunset. I wanted this oil to really push the color and light. Once I cropped the composition down from the larger version, I was left with the basic parts of the sunset. Every remaining element would be very important to the overall success of the piece. From the start, I decided that the overall color would be tangerine but to keep it interesting, a lot of different colors were applied the canvas and remnants of many of those colors remain. This work was done in about 5-6 painting sessions. Each time I returned to the easel the painting was demanding more power, contrasts, glow, etc. It was a very simple composition but it required a lot of moves and attention before it came to life. It was also very important to just leave it alone between sessions. Sometimes in the busy - ness of working to a finish, a lot of interesting subtleties go unseen and get covered up. It was nice to return to the studio and see those previously hidden notes present themselves. Those little gifts were left in place or used to take the oil further along. Honestly, it seemed like it would paint itself in the dark of the night at times and surprise me with some positive developments while I was sleeping. If you are watching, the paintings will speak to you as they evolve.